I’ve been rather bad this past summer in terms of trying to discover little indie/documentary gems out in the theaters. Working two jobs will do that to you. But I was able to squeeze in sometime earlier today to go to the Alamo Drafthouse (I swear this isn’t a plug) to go see Amy, a documentary about the life and death of singer Amy Winehouse, one of the most gifted and talented singers from the 21st century, who unexpected died of an overdose in the summer of 2011. While the general public mourned the loss of Winehouse as both a person and a musical talent, her death was not unexpected, as the singer had battled addiction for years, with it finally catching up to her at the age of 27. The film chronicles Amy’s almost sudden rise to fame in England, to when she recorded the album Back to Black, where she really shot to fame worldwide, to the downfall of it all. The media began to scrutinize her addiction after her success really took off, which took such a toll on her life, and affected not only her life but everyone else around her. Asif Kapadia, the director of the brilliant 2011 documentary on Ayrton Senna entitled Senna, directs this documentary, and it shares what made Senna such a unique documentary. There are talking head interviews throughout the film, mainly with Amy’s family and friends, but you never see their faces on camera, the only time you get to see what these people look like are through home movies, news clippings, etc. It’s not a wholly original technique, but its a unique one, and one that’s refreshing where most music docs would have these people talking about how much of a genius the subject was. While there are moments of that, because Winehouse was such a talented individual in terms of her songwriting and her voice, of course, but she was a flawed and tragic figure, almost from the very beginning. She came from a broken household, her father became a bit of an attention whore once his daughter’s fame skyrocketed, her then boyfriend to eventual ex-husband Blake Felder introducing her to an assortment of drugs, and so forth. Amy’s story is one that serves as a cautionary tale of a woman who wasn’t looking for fame, achieved it, and wasn’t sure how she could be able to handle it. It’s truly fascinating watching Amy from when she was about 16-17 years old, starting her young career off early, to when she eventually finds fame, and how she changes both physically and emotionally. Her bulimia really changes how she use to look as a kid, and how she becomes the skinny, tattooed-up and big haired singer that we all know so well. As you’ve probably read about leading up to the film’s release, the Winehouse family isn’t particularly happy about this film, with Winehouse’s father Mitch being the leading vocal proponent against the film, claiming that he’s been portrayed as the villain of the film, and that Kaspadia had an agenda going into this project. Obviously, I can’t say how accurate each little aspect of the film is, as every documentary has some form of bias in it. However, this project is easily the most emotional, personal, and closest account of Amy’s troubled life and career that the general public will ever get to see. We’ll never know Amy’s full story, but this is the next best thing. 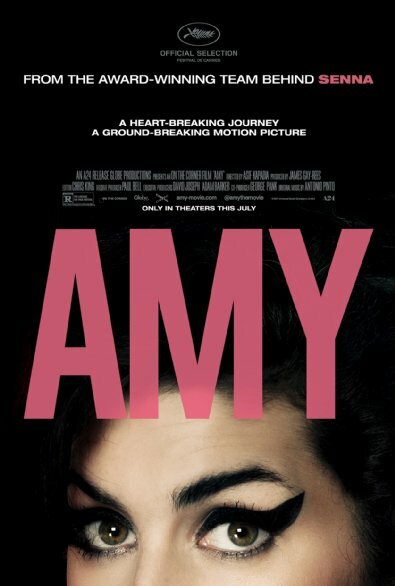 Amy is currently playing in limited theaters, primarily art-house cinemas, so if you can locate this film down, I highly recommend that you do so, either as a fan of Winehouse’s music, or for great documentaries in general. No matter what you thought about Winehouse or her music, it would be a little surprising if you came out the film with dry eyes. Jake ,my man, that is some good writing.